It’s G1 Climax Season again! With New Japan Pro-Wrestling just coming off their acclaimed shows in Long Beach, there’s no better time to completely immerse yourself in puroresu, and luckily, NJPW will provide an incredible number of shows over the next couple of weeks. The G1 Climax is their biggest yearly tournament, and is run using a round robin format. If you’re new to NJPW, it’s honestly a great way to see a lot of their top tier talent face off, and get a sense of the power dynamics that inform much of their storytelling. It’s the start of the build for WrestleKingdom, and it’s all terribly exciting. There’s a lot of obvious dream matches ahead, especially with the addition of outsider Kota Ibushi to the mix, so I wanted to take a moment to mention some matches that might slip under the radar. The G1 Climax can be overwhelming, but make sure you don’t skip these five bouts! Tetsuya Naito’s goth sons are going to fight and I’m so excited about it! Poor SANADA and EVIL have been regulated to near-meaningless six-man tags (they’re the current NEVER Openweight 6-Man Tag Team Champions) as of late, and getting a whole bunch of singles matches from both is an exciting prospect. They’ve also been presented as second tier Los Ingobernables members since the arrival of Literal Perfect Angel Hiromu Takahashi. It must be so frustrating to be shown up by a punk with a nice coat and a stuffed cat. What better way to get back into press conferences with Naito than mauling your brother in the biggest yearly tournament that NJPW runs? Whitney Otto once wrote, “No one fights dirtier or more brutally than blood,” and no one knows more about fighting dirty than Los Ingobernables. Who will win my heart, and the heart of Naito? Kenny Omega’s going into the G1 with the weight of the world on his back. He recently won the new IWGP US Heavyweight Title at NJPW’s Long Beach shows, his eagerly awaited third match with Kazuchika Okada is lurking at the end of the G1, and there’s the possibility that he might end up facing his old tag-team partner/career nemesis, Ibushi, in the G1 Finals. He’s also the current leader of the Bullet Club, but since Cody’s near-interference in Omega’s one-hour draw with Okada, there’s been a growing divide between the Elite and the rest of the Bullet Club. 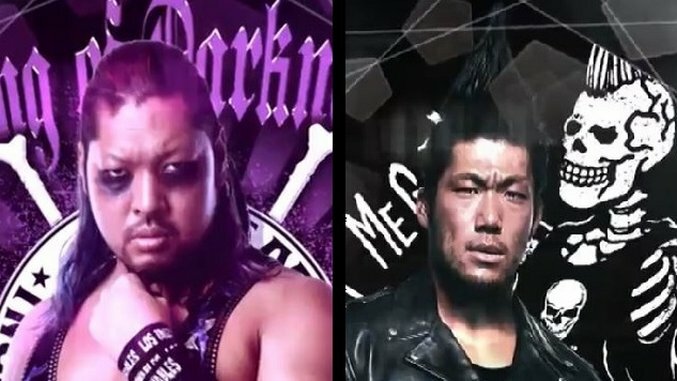 This is the only full Bullet Club match-up in the G1 this year, and it’ll be very interesting to see how or if that dynamic manifests in this match. Tama Tonga’s also been coming into his own recently, as his work with the Guerrillas of Destiny has been rad as heck lately. If nothing else, both these dudes are masters of shtick. This’ll either be a rad welcome committee for Tonga’s ascendance as a singles talent, or a sparkling palate cleanser from the turgid forced epics that sometimes plague the G1. Naito and Goto are men on similar trajectories. Both recently lost their title belts, and both are perennial main eventers as the circumstances demand. Naito’s a former IWGP Heavyweight Champion, and Goto’s challenged for that belt a number of times. They’ve both won the G1 Climax in previous years, and neither of them has a clear story line heading into the second half of the year. Both men went far in the G1 last year, with Goto going to the finals, and Naito only missing the finals by one loss (to Kenny Omega, the eventual winner). They’ve also got a lot of history, as Los Ingobernables had Goto in their sights for much of the end of 2015 and the first half of 2016. Would it be unreasonable to think that the man who triumphs here might be headed towards a title shot with Okada sooner rather than later? I absolutely don’t think so, especially with the persistent rumors of WWE gunning for both Okada and Omega. Zack Sabre Jr.’s foreign excursions have showcased how versatile a wrestler he can be when forced outside of his BritWres comfort zone. Watching Sabre Jr. try to pick apart human fire hydrant Tomohiro Ishii at the G1 Climax USA Special was a thing of beauty. It’s apparently super difficult to manipulate the limbs of Ishii since he functionally has crowbars for limbs, and watching Sabre Jr. fight for every hold while flailing around with near hopeless strikes was a captivating watch. It’ll be a lot of fun watching Sabre Jr. try to pull something out of his ever expanding toolbox to rattle the more experienced and tougher Yuji Nagata, who presents the toughness of Ishii along with a tremendous amount of acumen on the mat. It’s also worth noting this is Nagata’s final G1 Climax, and he’s definitely going to be going all out to make a good last impression. I expect big things from both competitors, but this’ll be a highlight: two grapplers, one with nothing to lose, and one with everything to gain. Toru Yano is the greatest wrestler in the world. For some reason, people are unaware of this. His comedic timing, his selling, and his ability to make repetitive shtick feel organic and new are all unparalleled. Minoru Suzuki is ALSO the greatest wrestler in the world. Obviously, their feud is the greatest thing in pro wrestling. Their matches consist of Suzuki beating Yano until he is near dead, and either Yano manages to sneak out a win and save his neck, or Suzuki completes the deed and murders him dead. Suzuki and Yano are the closest thing wrestling has to the Road Runner and Wile E. Coyote, two competitors who are enemies not due to history or their actions, but by their very nature. Added excitement comes from the fact that they haven’t faced off in a singles match in NJPW since the 2014 G1. Suzuki’s also been on a roll against CHAOS lately, knocking off both YOSHI-HASHI and Goto in the past months, and watching Yano spoil that would be incredible. Ed Blair is a writer and zinester currently writing out of Chicago. They run the Holy Demon Army Zine Distro, and can be found regularly contributing to the Atomic Elbow, No Friends, and Entropy. You can find them on twitter at @ourcityburning.